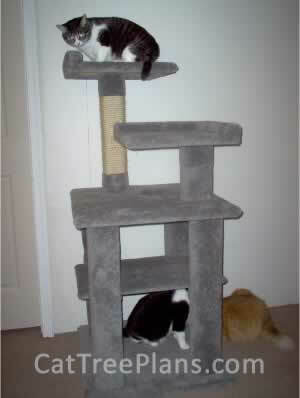 I have six cats and they just love all the trees/condos I've built so far. 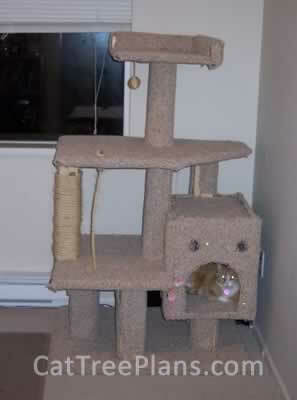 I built three of the the castle model as it is their favorite! The plans were easy to follow! Materials were easy to assemble! 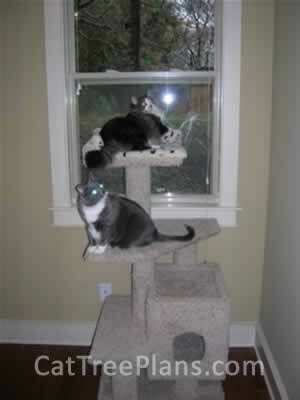 We wrapped the post to the perch with more rope and the cats love it. mostly cardboard wrapped with carpet for $149.00. GREAT PRODUCTS! Boots and Sadie appreciate it! Thank you so much for making these plans available. I was going to try to make my own, but using your plans made it so much easier. I put it together in two days, with no major diffuculties and my cats love it! It is a very clear instruction. I only spent a weekend to finish it. I made it a little wide to reach the window, so my mimi can lie on it to watch outside. 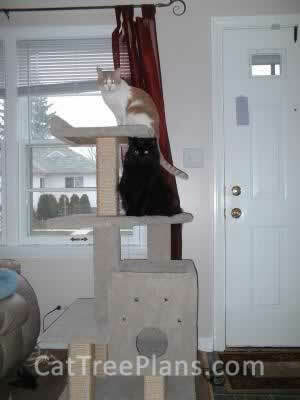 My boyfriend and I just finished making one of your cat trees. We were very impressed with how detailed the instructions are. 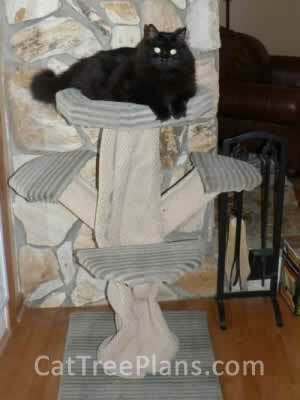 We had never carpeted anything before and the pictures were very helpful. 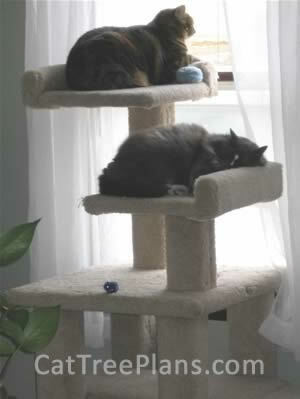 Our two kitties, Zoey and Kitty, have already claimed it as theirs. Thanks! 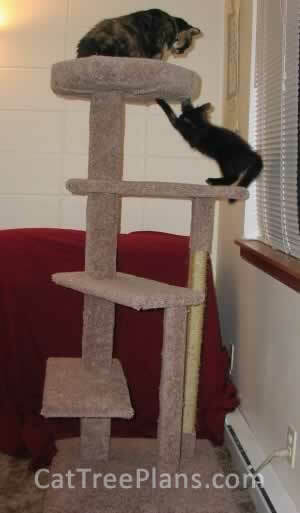 Our kitties thank you! The hardest part about it was getting started. The cats probably wonder why I didn't start sooner. Once I got going it didn't take long to complete. I'm now working on another. 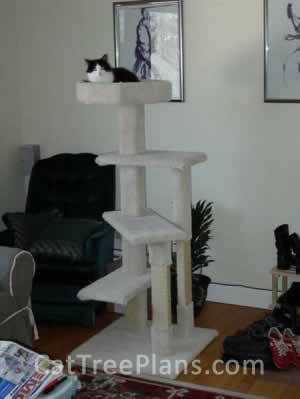 Here is my cat tree built with your plans! Thanks for the great plans.. everything was as easy as you said it would be, and I look forward to trying another set of plans. 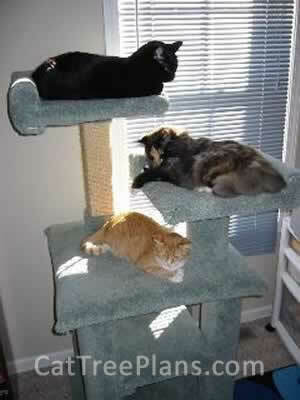 Please post this pic for my girlfriend (she's very proud of her cats!... well, so am I). 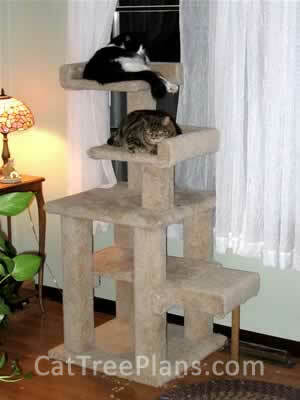 Tigger is on the top.... Gatsby is underneath him. 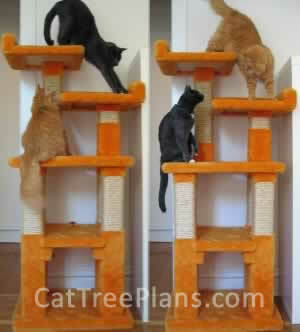 When I presented the finished product to my cats, Wallace and Darwin, it took them literally less than 60 seconds to claim it as theirs! The plans were simple to follow. Thank you for the great site and great plans! 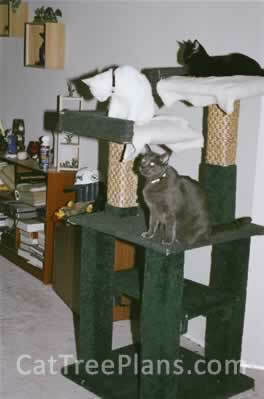 Attached is a picture of my cats Charlie and Abby playing on the cat condo I built from your plans. 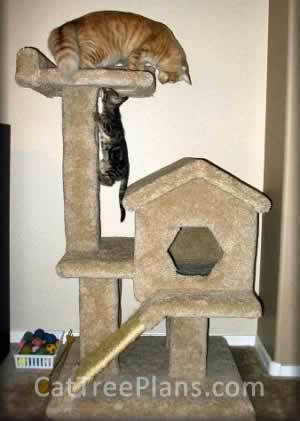 They love it so much, they fight over who gets to be on it...I'll guess I'll have to build another one. Thanks again! 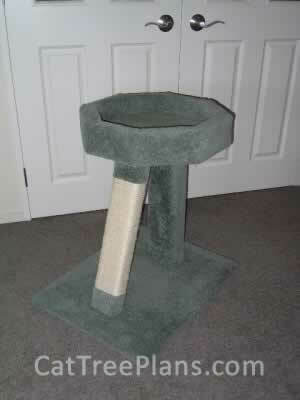 I built cat tree #5. 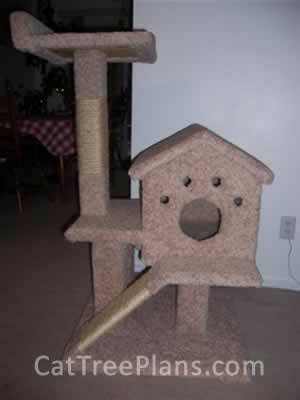 It went together great and my cats love it! 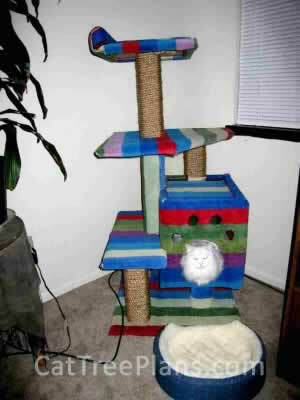 I actually have some friends that want me to build their cats one now! Thanks for the awesome plans. Here is a pic of Zoe enjoying the tree. Excellent plans, easy to use. Thanks. I will start another in a few weeks. Thank you for your great plans. instructions could not have been any clearer, and I am very happy with the end result. 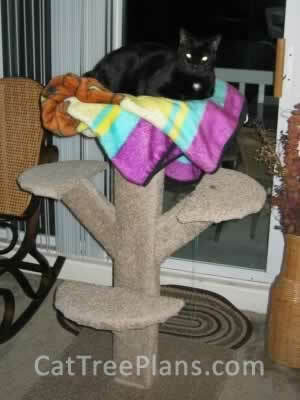 Needless to say, our feline friends took over it before it was even ready (I had to watch out not to staple any tails). 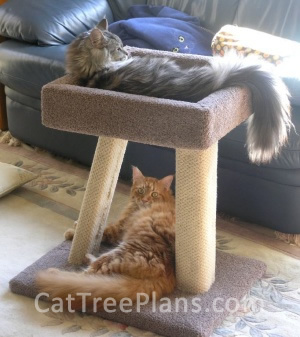 We bought your cat tree plans and made one for a donation to our local humane society. 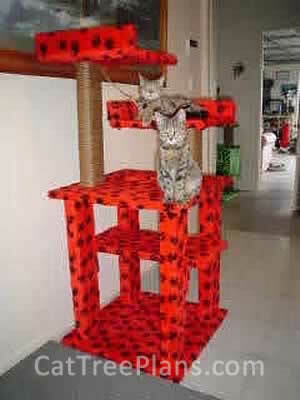 It was made from scraps of wood and carpet that was donated. 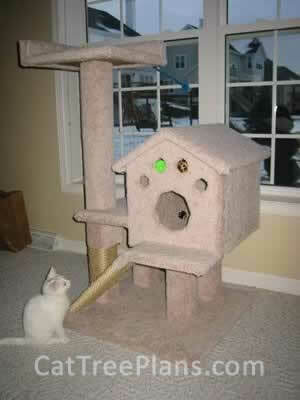 However, the cats in this cattery don't seem to mind that it doesn't quite match. I bought plans from you guys a while back . I really liked the tree I built with your plans! Thanks so much for the wonderful plans. 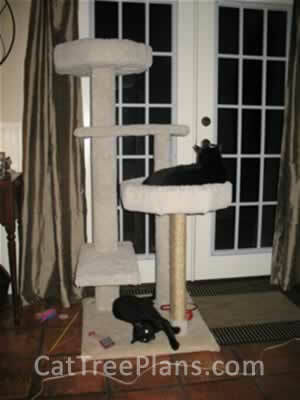 The tree was a big hit with our furry kids. 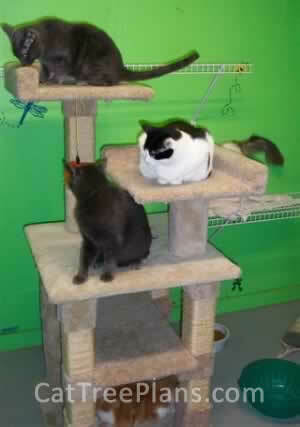 This is Gypsy, Domino, and Purrseus enjoying their new tree. We can't wait to start the next one! 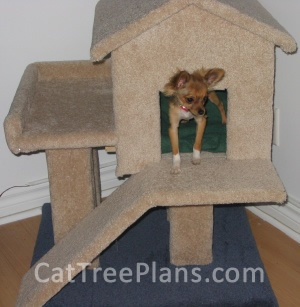 We modified a little bit the plans to make it accessible to our dog. There is a patio door that allows her to go on the balcony (It is where she eats). Thank you for your plans, very well explained. Where sending you pictures of her house so you can post them on the web. Pootchy loves her new home! 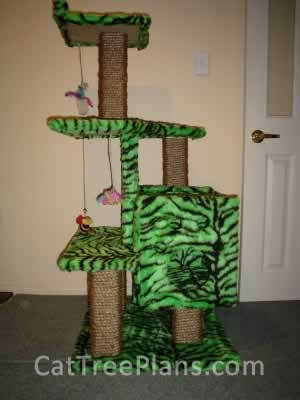 Made with sisal rope and 100% wool carpet. Made in 1 Day..WOW so easy and fun at that! Made with Fluffy fake fur with carpet underlay underneath and removable lid with removable padding inside box incase of accidents. 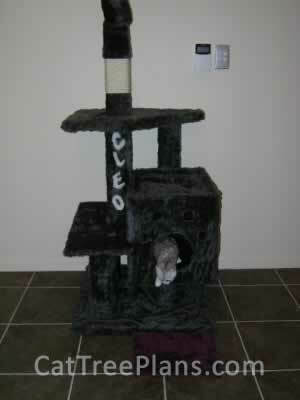 "Cleo" our British Silver Tabby female is 11 weeks old and loves her new cat condo. 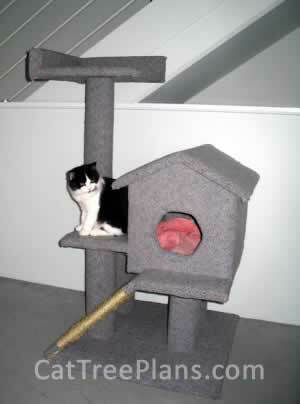 We cut out fluffy letters and attached to Her home for a more personalised look - sisal scratch rope attached to top post for her busy claws. We also made a little porch for her to jump out on.